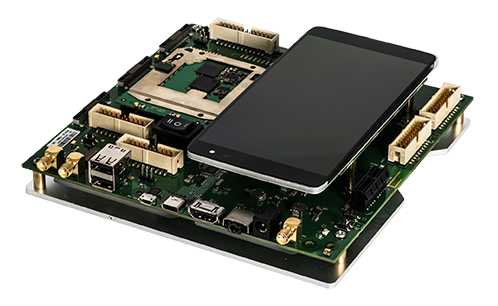 For developers working with OEMs and device makers that need to evaluate processors and peripherals, the Qualcomm® Snapdragon™ 835 mobile hardware development kit (HDK) is designed to help jump-start premium mobile device development. Based on the Snapdragon 835 mobile platform from Qualcomm Technologies, this HDK is a dynamically featured Android development platform designed to provide an ideal starting point for creating high-performance mobile devices and applications. With an advanced 10-nanometer design, Snapdragon 835 platform is engineered to support long battery life, lifelike VR and AR experiences, cutting-edge camera capabilities, and Gigabit Class download speeds. The HDK also supports our optional WQHD AMOLED LCD or 4K HDMI out, 4K Ultra HD H.264/H.265 encode and decode, 2 x 16MP or 1 x 32MP cameras, audio in/out, microphone inputs, and 3000mAh Li-Ion battery.